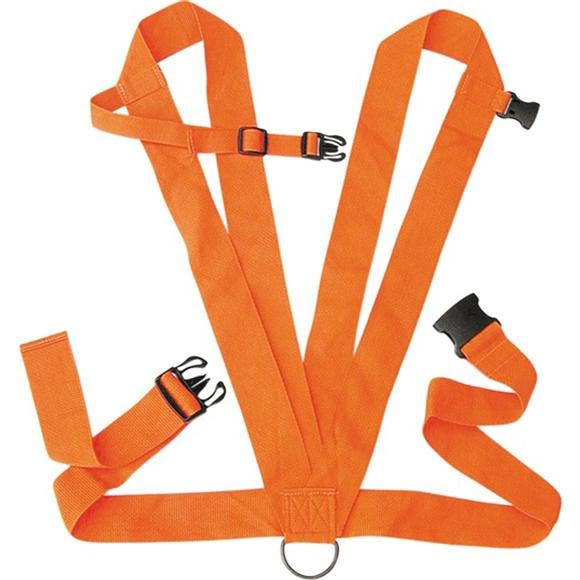 Make your life easier this season with the Dual Harness Deer Drag from The Allen Co. The shoulder straps and waist belt are made with heavy duty 2" web construction for durability and hunter's orange for safety. The harness also features a sternum strap. Make your life easier this season with the Dual Harness Deer Drag from The Allen Co . The shoulder straps and waist belt are made with heavy duty 2" web construction for durability and hunter&apos;s orange for safety. The harness also features a sternum strap. Compact, light, and great for throwing in your hunting pack, this drag can also be used with other large or heavy items, like tree stumps or tires. Includes a steel D-ring and drag rope. Measurements 2.85" x 6.75" x 2.55"